A new kitchen can be an exciting project, but what if your design ideas are compromised by the size and dimensions of the room? Some kitchen spaces are more difficult to design than others. Whether you’re wondering how to make the most of a long, thin kitchen, or you have an open plan area to fit out, a single wall kitchen may be your best option. One-wall kitchens have the smallest possible footprint of all kitchen designs. As the name suggests, all kitchen units and appliances are incorporated along a single wall. Fewer units should mean that this type of kitchen layout should be more budget friendly than other types of design, while a well-planned design should make for an efficient workflow. This is all very well in theory, but having the entire kitchen run along one single wall requires a few design tricks to make sure that the space works in terms of practically and functionality, while looking great. Here are some great ideas to help you make a single wall kitchen work for you. With space at a premium you may be faced with a critical choice of what’s really important to you in the kitchen. 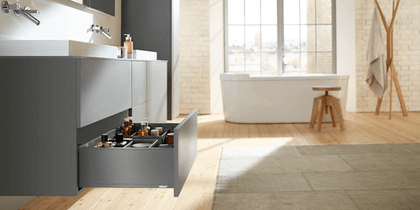 You might be able to squeeze in a galley kitchen, with two parallel rows of kitchen units to maximise both storage and worktop space. However, by keeping all the cabinetry to one side of the room, you could free up valuable space for a seating/dining area and turn your kitchen into a sociable area too. Adding a table and chairs, or perhaps some built-in bench seating (ideally with concealed underseat storage) is a great way to put the fun into kitchen functionality. Open plan kitchen/diner designs have become increasingly popular in recent years. Whether you’ve knocked through two previously separate rooms, or have bought a new home with a modern open interior design, a kitchen island is a clever way to transition from the kitchen to the dining area and beyond. Add extra prep space and storage below with a kitchen island and improve the overall functionality while giving your home the wow factor. Depending on the space available, the island can double up as a space saving breakfast bar or dining area, while spacious rooms will benefit from an extra wide island. If you’re pushed for space, solid wall cabinets may give a top-heavy appearance that makes your kitchen look narrow and unwelcoming. The answer is open plan shelving to take the weight out of the top half of the room. Open shelf storage is a real trend at the moment – but the trick is to curate the items on display to make them look pretty and deliberate, adding to the overall aesthetic effect. Whether you go for custom made joinery or budget friendly shelves, make sure the shelving itself is a beautiful design feature, then fill it with gorgeous items you will love to have on show. If you only have one wall to put your kitchen against, you may as well make it a good one. Rather than let your kitchen fade into the background, make it a real design statement. You can do this by making the kitchen itself the focal point of the room, for instance by choosing kitchen cabinets in a bold, gloss colour. Alternatively, why not pair a neutral kitchen and unfussy cabinets with statement accessories, such as designer shelving or a distinctive splashback, that really stand out? Contemporary homes excel at minimalist design that creates a sleek, uncluttered look oozing both spaciousness and tranquillity throughout the home. A streamlined, handless kitchen in high gloss white will sweep along the wall without impinging on the space. If you want unfussy cabinets and an understated look that lets the rest of your interior design scheme shine, choose kitchen units that seem to almost disappear into the wall.